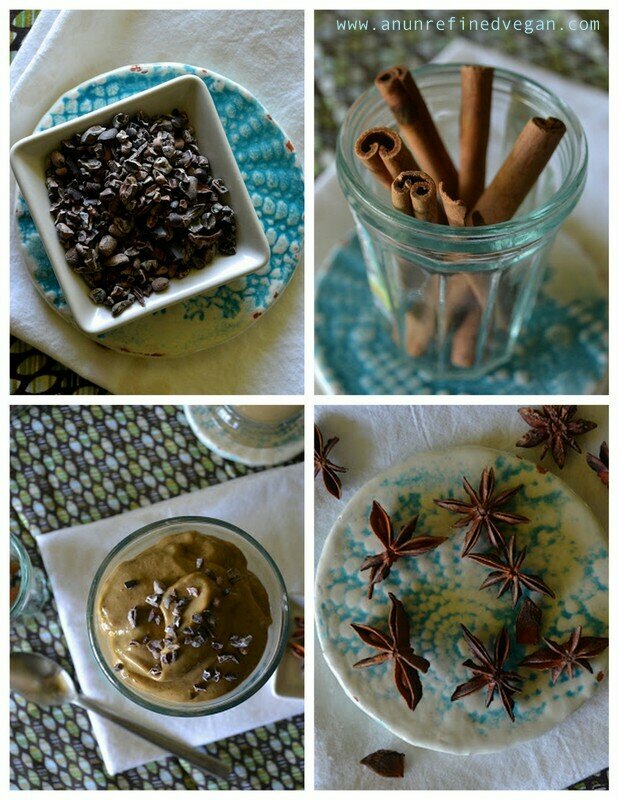 Spicy chai, my favorite hot beverage transitions right into summer with a cool, creamy version that also features another favorite: chocolate. Kale included at no extra charge. You’ll need a spoon for this rich and creamy chocolate green smoothie. Combine all of the ingredients – except the cacao nibs – in a blender. Stop blender and stir occasionally if necessary. Process until smooth and creamy. Top with cacao nibs, if using, and serve immediately. The slight spice goes so well with chocolate – and oh yeah, chocolate and PB is a staple in our house! Sounds super delicious!! Love chai tea! Chai tea is one of my faves, too. Always looking for a way to use those flavors. That looks divine! I’ve never frozen a banana before, this could be a new experience for me. I made a smoothie the other day with a banana that was getting a bit over-ripe, and some strawberries and dates, and I remembered you and your green things and chucked some spinach in there too. I’ve never put that in a smoothie before but I was going by your rules and it worked out great. One problem I have though, and it may be my blender, is that when I put dates in I’m always left with some lumps at the bottom that don’t whizz in nicely. Do you have any tips? Lorna! I’m so proud of you! Dates can be tricky like that. I give mine a rough chop and then process like heck. I think I saw on a blog somewhere – chocolate kale chips. I’m withholding judgment ;-). I haven’t yet gotten on the kale chips bandwagon – really just haven’t gotten around to it yet. So – – it could be that I would love it. I just recently tried a chai latte and I was in love with the flavors of November. This smoothie would have me swooning, it looks delicious! Oooh, a chai latte sounds great! I find lately I’m on some kind of “wavelength” with other food bloggers lately. Your post, serendipitously, is along the lines of a chai chocolate mousse I’ve been wanting to test out. Your smoothie looks dreamy! I think chai and chocolate are a winning combination. I am VERY interested in your chocolate/chai mousse! Sounds incredible! This looks amazing! I never thought of using tea as a base for smoothies! Can’t wait to try it out! I use tea from time to time – green is great and also hibiscus. Wow, lady! This sounds absolutely incredible! What a delicious way to start the day. I love how you’ve hidden kale in this tasty treat. Hope you’re bringing it to Raw Foods Thursday this week! It tastes nice and decadent ;-). Thanks, Heather! Oh. OH. Look what we have here. Well, this looks freaking DELICIOUS. Why don’t we live together again? Yum! I use kombucha sometimes as my smoothie base, chai sounds good too. Now, someone please explain this to me: How is cacao different from cocoa? Other than placement of the vowels..
Oh wow! Now that I wouldn’t have thought to try! I brew kombucha – must try! Thanks for the suggestion. My understanding is that the words cacao and cocoa can be interchangeable, but in the raw world, cacao is the raw version of cocoa powder (since it is heat-processed). Wow, that looks decadent and delicious! I just happen to have some cacao nibs too. All of the other ingredients are staples in my kitchen. Hehe – you saw right through me! I’ll trade you for some of them cinnamon rolls! …I knew it! Trade for sure! I agree.. that is one heck of a pudding .. and all those flavors and kale in it. man, i cannot wrap my head around all of that. What a delicious combo! This sounds fabulous! Lately I’ve been skipping smoothie posts…. feeling like there’s nothing new in that department. So glad I read this one – and should have just asked you to break out something awesome in the smoothie world. Didn’t have to ask – thanks! Yum what a great idea!! Delicious! You had me at “chai.” This looks fantastical! That looks so good…I am just lusting after one. I didin^t know your blog but congrats its wonderfull!!! Cute beverage styling! I never had chai in my smoothie, but that’s a great idea! Miam! Oh you’ve got to! It’s wonderful. Pingback: Start a Green Smoothie Habit for the New Year! I so need to try this! Love how it needs a spoon ! !